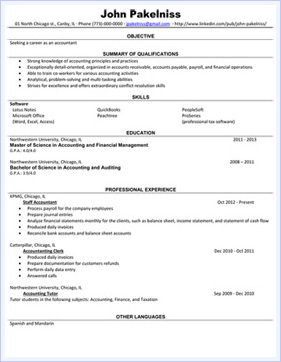 In order to find a job you need to have an outstanding professional resume. There is no only one way on how the professional resume should be written. However, there are certain sections that commonly expected to be included in your resume, such as objective, summary of qualifications, education and trainings, professional experience, and affiliations. Even though the order of these sections can be different, but usually objectives and summary of qualifications should go first. Therefore, with all of that in mind, start the resume with your full name. Make it bold and use the biggest shrift in comparison to all other shrifts that you will use in this resume. On the second line include your full address without abbreviations, e-mail address and phone number with extension if applicable. Add there the link for your personal website or LinkedIn profile if you have them. Depending on your specialty and personal preferences you can write about anything you want. However, don’t forget to write only relevant information to your current job search. In addition, pick carefully each word that you are going to include there because usage of proper key words is essential in order to have an outstanding resume. List all the names of education institutions, its cities and regions that you attended along with your major and degrees earned, such as associate, bachelor’s, and master’s. Also include your GPA if you have at least 3.0 out of 4.0 and year of graduation or expected year of graduation. Put in bullet points all your certifications and professional developments. You can include any courses or training you attended relevant to your current job search. For example, if during tax season you worked as a tax preparer, you can put that you attended continuing education tax courses and year of attendance. List companies names, cities, regions, and period you’ve been with them (from month/year to month/year). Put in bullet points all the work you did there. Be very specific, the more key words you will be able to include the better. List any technical awards that you have won in your industry. The award could include any recognition from a school, company you’ve worked or volunteer for (anything that is relevant to your current job search). Include memberships in any professional organizations both current and past. Be sure to clearly indicate whether you are still a current member of the organization. Provide names, cities, regions of these entities and the year you entered / leave them.